3 Bramber Court, 2 Bramber Road, LONDON W14 9PB. The Windows story is a lovely one. West Indies, at 200 for 7, fighting to save the 2004 Lord’s Test against England, an established batsman within reach of a second hundred in the Test and Tino Best, the number nine batsman coming in to join Shivnarine Chanderpaul. Bare statistics don’t lie and, although Best’s innings states that he was in for six minutes, faced seven balls and was dismissed stumped Jones bowled Giles for 3, scorecards cannot naturally show the weight of intent in Tino’s brief innings. Andrew Flintoff, noticing from slip the ambitions of the number nine West Indian batsman, advised him to mind the windows. In his foreword, Flintoff states that he was thinking of the Media Centre windows which was rather a shame, I felt, as I was sitting along the Pavilion concourse and felt that we could have been in danger. History shows that we weren’t, Tino didn’t manage the boundary at all but it became one of cricket’s most memorable quotes. The West Indies of that era were not the vintage of the 1970s and 1980s but, in Fidel Edwards and Tino Best, they most certainly compared as favourably as the fast bowlers of their glory days. 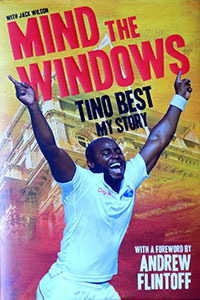 Tino Best’s autobiography Mind the Windows, is, as may be expected, a straight-talking and exciting book covering much both on and off the field. It isn’t, though, your normal cricketing autobiography. Tino will be remembered as the number 11 who finally did connect with the ball against England at Edgbaston in 2012 where he made 95. It was a shame that he missed the milestone of being the first number 11 to score a Test century but there is no doubt that he was a better batsman who might have batted slightly higher. There is something fascinating and enjoyable about watching Tino Best on a cricket field and the effort expended. His book, too, makes for exciting reading. Like other West Indian cricketers, Tino tends also to talk about himself in the third person. Was it not his uncle, Carlisle, who in an earlier era, commentated at the crease about his shots? Mind the Windows is a fast-paced book which will, I am sure, appeal in its unique way.